I feel like comfort food is in order tonight. The power has been flickering on and off all day and the threat of more snow is pretty strong right now. Chores around the farm leave us chilled to the bone and extra exhausted. Taylor’s been on the roof multiple times shoveling off snow, and we’re constantly shoveling around the chicken coop so the girls can get to their water source. Late nights have been spent on the tractor plowing the driveway and shaking snow of the greenhouse roofs so they don’t collapse. It’s been a harsh winter so far and we’re starting to feel worn down from the conditions. Luckily, there hasn’t been too much damage and we feel extremely fortunate that we have a warm home and a well stocked kitchen to carry us through. I know not everyone is as lucky and my heart goes out to folks that don’t have a warm place to be or a hot meal to nourish them on these frigid nights. This slow cooker chuck roast is food for the soul. 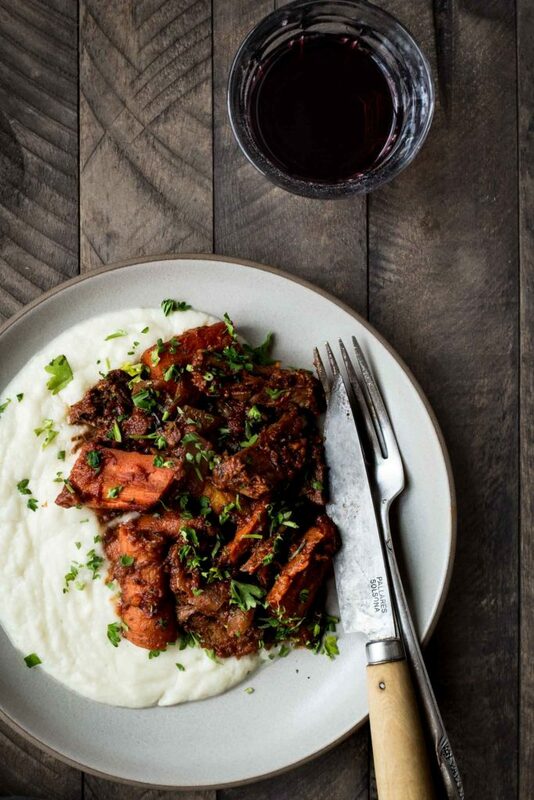 We served our roast with a side of silky smooth cauliflower puree and a few glasses of red wine. We’re slowly getting through our cow share this winter and this is one of my favorite meals we’ve made so far. If you don’t have a slow cooker you can easily make this in the oven and slow roast it for a few hours. Just note the cooking times will vary. This meal is hearty, nourishing and perfect for a cold winter night. I hope wherever you all are that you’re warm, safe and have a cozy kitchen to cook in. Rub the roast all over with salt and pepper. Heat the oil in a large dutch over medium high heat. Brown the roast on all sides and remove from the heat. Place the roast, along with the remainder of the ingredients (minus the parsley) into a 6 quart slow cooker. Cook, covered, on low for 8-10 hours or until the meat is tender. Remove the roast and veggies from the slow cooker and shred the meat. Pour the gravy mixture into a pitcher, give it a good stir and let it stand for about 10 minutes. Use a spoon to scrape off the fat that rises to the top. Keep the gravy to the side. When the roast is almost done cooking prepare the cauliflower purée. Bring a large pot of water to a boil. Add the cauliflower florets and cook until tender, about 8-10 minutes. Use a slotted spoon to transfer the cauliflower to a high speed blender. Measure out about 1/2 cup of the cooking liquid and add that to the blender along with the butter, salt and pepper. Blend on the highest setting until completely smooth and creamy. Add more liquid to thin as needed. Tate test and adjust seasonings as needed. Serve the cauliflower purée with the shredded meat and veggies. Drizzle with the reserved gravy/sauce and sprinkle everything with minced parsley. Enjoy warm or at room temperature. This looks so yummy 🙂 I love anything cooked in a slow cooker! Just in time for the weekend. Looks delicious. Thanks. Be trying this out tomorrow evening. A hearty nourishing dinner to keep your strength up. You will need it after your heavy work. I love my slow cooker during the winter months. This blog is a favorite of mine. The story leading up to the recipe, the real food ingredients, the beautiful presentation and pictures…I look forward to each entry !! I can almost smell the food and feel the warmth of the fire as the snow pounds down around you !!! Stay warm and safe !!! Sorry I’m not sure…are they actually printing with the recipe? or just visible when your on the website?